That’s how we made Virgo Incense, by thinking about what scent a Virgo personality would like. The incense is made specifically for the logical and intelligent Virgo! The sign of Virgo means you were born between August 23th and September 22nd under the sign of the Goddess of Wheat. A sign that fits the practical Virgo perfectly! With elements of logical practicality, you are known to be balanced and fair in your communications and relationships. Your qualities are steadfastness and warmth. You are grounded and solid. Traits of a Virgo person include shyness, but it doesn’t stop you from getting what you want. You are meticulous and reliable, making you a great friend. Sometimes analytical and mostly nurturing you love animals. You are a hard-worker and have no time to waste. The most compatible signs with Virgo are Taurus, Cancer, Scorpio, and Capricorn. You are ruled by the planet Mercury, the planet of communication dominance. You learned to talk about what you are thinking and feeling. Those ruled by Mercury learn to be the best improvisers. You are also ruled by your digestive system, intestines, spleen. You may have trouble with cheese and bananas. Your specific LEO scent in the incense is a blend of Gardenia and Sandalwood to match your nurturing personality. These two beautiful scents come together and excite your natural meticulous self! The Virgo person is a perfectionist and shy. Your demeanor attracts others to you! You are a fantastic employee because you are engaged and care about your work. 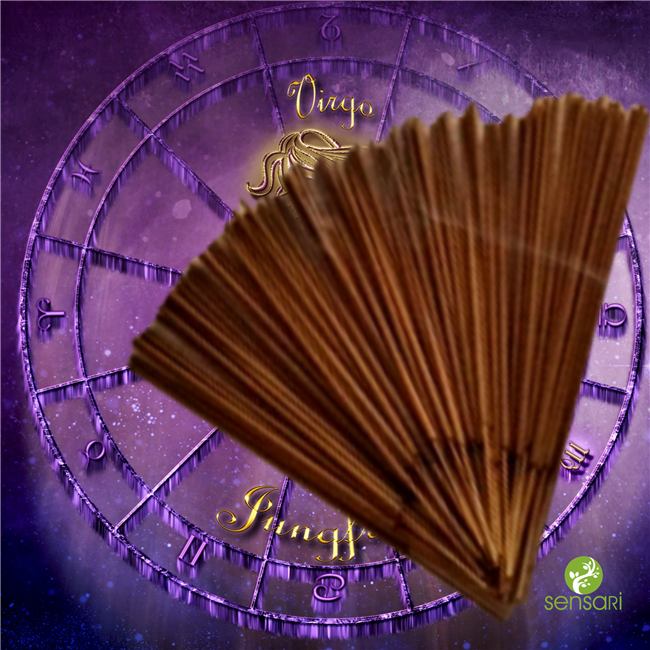 Continue your adventure with VIRGO incense, supporting the real you! There are scents available for all the zodiac signs! It makes a great and caring gift. Other people under the sign of Virgo include: Beyoncé, Keanu Reeves, Cameron Dias, and Michael Jackson.